Good Morning, It’s the middle of the week already and I’m not sure where the time is going so fast. That said over the next month I have two short weeks at work for the Easter holidays and then I a week booked off work for the first May bank holiday (the Uk’s name for public/national holidays). Today’s photo features a range of items from Bloom. 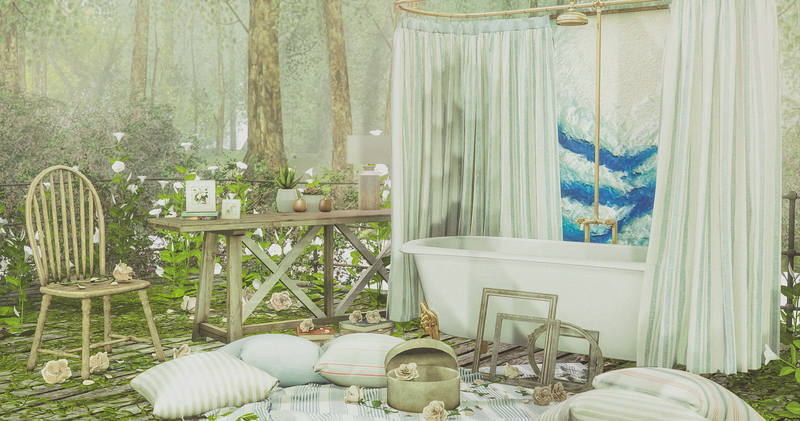 I’ve mentioned before about one of the things I love most about decorating for SL, and especially decorating for photo scenes, is that you can do what you want with no concern for whether it’s RL feasible. Though of course, if you wanted to have a bath on a platform, in the middle of a lake, in a forest, in real life you could but good luck with the plumbing! Still playing catch up at rl work so short and sweet again today! Happy Wednesday!